From the jihad wilds of Africa, Central and Southeast Asia an Afghan warlord has emerged as an unlikely favorite to become his country’s next president. Abdul Rasul Sayyaf – blamed for the deaths of thousands – has declared his candidacy for polls due later this year and political insiders say his chances are better than good. Sayyaf’s ties have included Osama bin Laden and al-Qaeda, the Southeast Asian terror outfit Jemmah Islamiyah (JI) and the widely loathed Abu Sayyaf Group (ASG) from the Southern Philippines. The ASG adopted his name after he trained Filipino members for jihad in Africa in the 1990s. Karzai will stand down at elections due in April next year, at the end of his second term, as mandated by the constitution. That will clear a path for Sayyaf, who is one of three early favorites for the top job. The other two are Abdullah Abdullah, who almost won four years ago, and Ashraf Ghani, a former finance minister. Both are well known quantities where Sayyaf is not. The Independent Elections Commission (IEC) last week began receiving applications for 2014 presidential nominations. 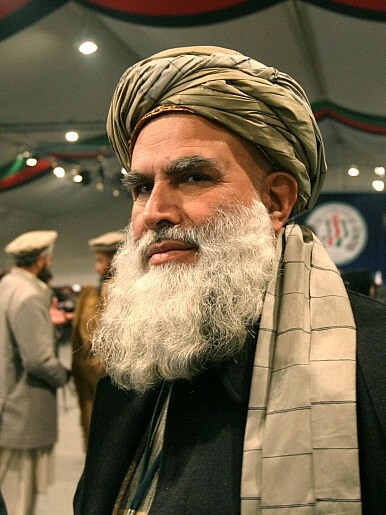 Battle-hardened, Sayyaf earned his initial stripes fighting Soviet occupation in the 1980s with the Arab-backed Islamic Union for the Liberation of Afghanistan (IULA). He mobilized Arab volunteers for the mujahedin and caught the attention of another Arab fighting the Russians, Osama bin Laden. Civil war followed and bin Laden shifted his operations to Sudan, until he was expelled in 1996, under international pressure. Osama moved back to Afghanistan and immediately invited Sayyaf into his tent. Sayyaf had gained experience in Africa by training young Muslim Filipinos arriving from the war-torn Southern Philippines, where an essentially ethnic civil conflict was being complicated by foreign militants keen to use the region as a base and hideout for jihad to be spread across Southeast Asia. The al Harakat al-Islamiyya had begun its push for independence and an Islamic theocracy in 1991 but so enamored were the rebels returning home, the group was soon renamed the Abu Sayyaf after their Afghan mentor. Numbering 1,000 active members at best, the Abu Sayyaf never enjoyed the same support among locals as established groups with more than three decades of fighting behind them. But they did form a strategic alliance with Jemaah Islamiyah (JI), which comprised mainly Indonesians and Malaysian jihadists with direct links to al-Qaeda under the religious stewardship of the hardline preacher Abu Bakar Bashir. Their quest for a Southeast Asian caliphate was underpinned by a 10-year bombing campaign, mainly in Indonesia, that left thousands dead and maimed. Allegations have also surfaced that Sayyaf had assisted in the assassination of Ahmad Shah Masood, the military chief of the Northern Alliance, which continued to fight the Taliban from 1996 until his death just days before the September 11, 2001, attacks on the United States. But Sayyaf moved on. In the post-9/11 era he played the Afghan factions, eventually controlling the Ittehad-al-Islam, which by 2005 had been transformed into a political party named the Islamic Dawah Organization of Afghanistan. Despite these conflicting affiliations he joined the Northern Alliance. Many younger Afghans see the elections not as a source of inspiration, but of frustration. Peace, Politics, & Afghanistan's Next President10 Priorities for Afghanistan’s New PresidentHow Afghanistan Pulled Back From the Brink4 Reasons Elections Won't Fix AfghanistanCan the Afghan State Survive the Peace Process?